Preliminary work on the development of the FasTrack breeding system with California plum varieties has been undertaken at the USDA-ARS research facility in Kearneysville, WV, and Dr. Scorza's team has observed significant progress. 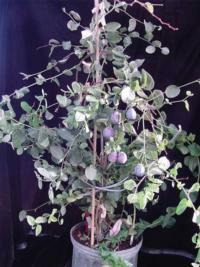 196 transgenic plum plants (ie., carrying the ECF gene) were established in the greenhouse. 21% of plants flowered in less than 10 months after planting (Fig. 1) and showed normal morphology. 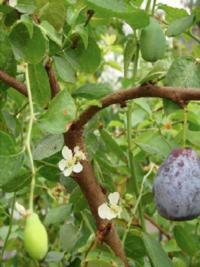 Plum fruits borne on these trangenic plants developed and ripened normally. Seeds of early fruiting transgenic plums readily germinated in vitro as well as in soil, which ensures continued propagation. As a result of the above events, >10 different lines of plum tree have set fruit within the first 14 months of growth. These trees are continually flowering and and several rounds of pollination have produced fruits at different stages of maturity (Fig 2. flowers, immature fruit and mature fruit on the same plant). The induction of early flowering and fruit production within a year of transformation presents an important genetic tool to reduce the generation interval of plum and potentially other related fruit crops, drastically shortening the breeding cycle and will facilitate rapid analyses of genes involved in flowering and fruit development.